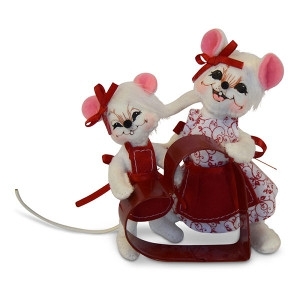 This set is adorable with the 3 inch and 5 inch white mice. The little one is wearing a red apron and has a red bow in her hair. The larger one has a dress done in a delicate red and white filigree print with a red apron over the skirt. They are holding a red metal heart-shaped cookie cutter. Cute item to add to any kitchen display!